Founded in 1983, Kidbuddie has long been South Africa’s preferred manufacturers and suppliers of safe and enjoyable jungle gyms and playground equipment for schools, pre-school and early years. We cover it all with innovative playground design that include swing sets, slides, and structures that guarantee safety and fun for children. Whether you wish to custom design your playground or need some equipment or parts, come to the leading suppliers of outdoor commercial playgrounds. Our services are available through out South Africa, we deliver to all the main centres countrywide and have experienced installation teams in Cape Town, Johannesburg, Durban, East London, Bloemfontein and the Garden Route. We have also exported to Lesotho, Namibia, Botswana as well as Angola and Mauritius. All our commercial playground equipment is manufactured to strict SABS specifications. All designs are available in Kit form with detailed installation instructions, for clients who wish to install themselves. 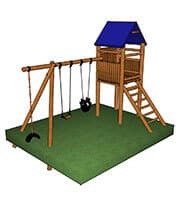 Our DIY Sqaure Range wooden playground equipment is an outstanding range of equipment, long proven in thousands of installations, and its aesthetic appeal and design superiority continue to make it a favourite. Speak to us about creating fun, safe and interactive outdoor play systems for kids!